Water fountain has existed since 2000 years ago in Mesopotamia. Early function of water fountain was as a source of clean water for daily use in towns or villages. At that time, the source of water for the fountain is always at higher position than the fountain. Ancient Greek at 6th century BC started to decorate the fountain. They use bronze pipes connected to the head of lion statue made from natural stone or marble with the water spouting from the mouth of the statue. Ancient Roman used aqueducts system and water fountain intensively to distribute water in their cities. Ancient Rome was known as city of fountain due to the innovative design and rapid growth of water fountain. At medieval age, the growth of water fountain was very limited and numerous Romans water fountain were neglected. Water fountains only exists in places and monasteries. After the spread of Islam, water fountains started to flourish again through Islamic gardens of the Arabs and Persian. One of the famous water fountain at that time is the Alhambra water fountain in Granada which is the capital city of the Moorish Kingdom in Spain at the medieval age. During Renaissance and Baroque era, water fountains appeared again and improved very rapidly. With the appearance of arts and literature on that era, a number of water fountains were designed artistically with the result of numerous water fountains with excellent aesthetic design such as St. Peter Square water fountain, Piazza Navona water fountain, Neptune water fountain, Triton water fountain, numerous water fountains in Versailles Palace, and mainly the famous Trevi water fountain. At the start of 19th century, water fountains kept evolving and start to use different type of materials with more innovative design. In France, water fountains as source of water were improved. United States also started to get involved in water fountain technology and innovation. With the emergence of steam pump at the 19th century that can pump water directly to building, the function of water fountain as source of drinking water ceased. At the 20th century, water fountain functionality has changed as decoration and aesthetic purpose started with the appearance of classical water fountains, contemporary water fountains and majestic water fountains. The first fountain with the highest spray in the world is Jet D'eau fountain in Geneva and the current record holder of fountain with highest spray is King Fahd water fountain in Jeddah. With the arrival of digital age at 20th century, water fountain technology is advancing and musical & dancing fountains emerged. Currently, musical water fountain with the grandest choreography is Dubai water fountain. There are a lot of water fountain variations that digitally control the combination of water spray, illumination and music with amazing result. Please look at the water fountain classification below to know the differences of water fountain. Architectural fountain can be found everywhere in any sizes in Indonesia. 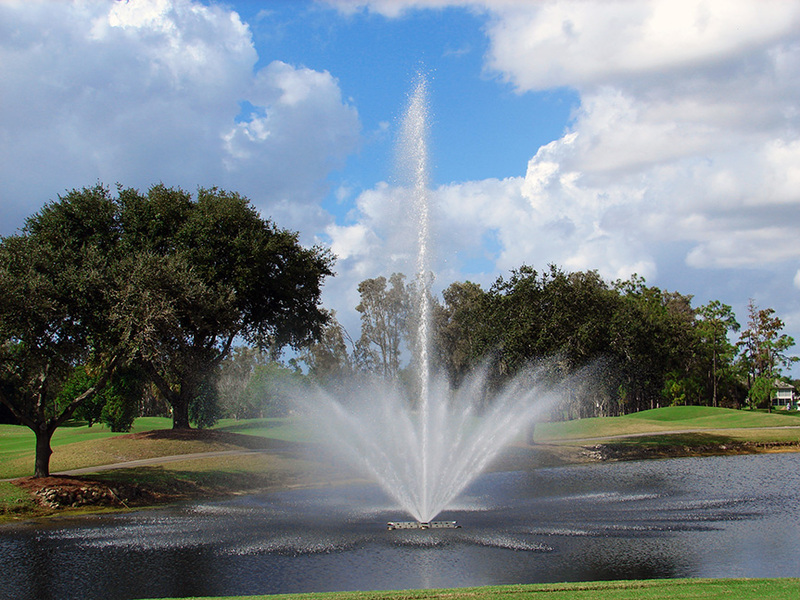 This type of fountain is installed to enhance space and building esthetically. It can be found in public or private places such as city parks, office complexes, hospitals, government buildings, mall & apartment and so on. Architectural water fountain also provides cool and relaxing ambiance. Floating fountains are not common in Indonesia. They mostly can be found in golf course. Sometimes floating fountains can be found in huge pond or artificial lake located in luxurious residential area and mall. This type of water fountain beside aesthetically pleasing to look at, it also assists in aeration of the pond or lake to have enough oxygen. Floating fountain is normally used in large body of water where installation is difficult. Dry-deck water fountain is getting popular and start to appear in Indonesia. This type of fountain spray can be static (fixed spray pattern) or dynamic (changing pattern or leaping). This type of fountain can have several functions. One of it is as interactive fountain when people (usually children) can touch and play with the water. As interactive fountain, the water should comply to clean water standard in which it has sterilization system to deactivate the pathogenic microorganisms. Other function is that the deck can be passed by people when the fountain is not activated. Dancing fountain is usually a dynamic water fountain. This type of fountain utilize static nozzle (one directional spray) or dynamic (multi-directional) nozzle. If they use static nozzle, the spray can be set and choreographed with other nozzles to present an amazing show. When using dynamic nozzles, the show become more interesting due to the moving nozzles. Dancing fountain can be combined to go along with music and it is called musical dancing fountain or musical fountain. Musical dancing fountain is available in modular or customized. Modular water fountain is assembled into 1 set system with nozzles, illuminations, pumps and other supporting equipments. The client just need to inform the length & size and the specific specification for order. Whereas, customized musical fountain is available in any creation according to the customer request. The placement can be arranged into random, square, circular, placed unto bridge or anything as long as the design make sense and technically feasible. The video shown is modular musical fountain.